I've been cleaning out my grandmother's dresser for the better part of the day, and I'm still not quite done. It's almost like I'm on my own little treasure hunt, and so far I've come across some great finds. I found lots of vintage jewelry, lockets, pocket watches, antique embroidered napkins, vintage perfumes (a bottle of the Gucci No. 3 - one just sold on Ebay for $100! ), tons of silk scarves, my grandmother's NRA (National Rifle Association) marksman badge (go Mow-Mow), old photographs, a WWII U.S. military compass, and all sorts of other finds. My mom will go through everything I've organized once she gets home from work. Wouldn't you love to entertain here? 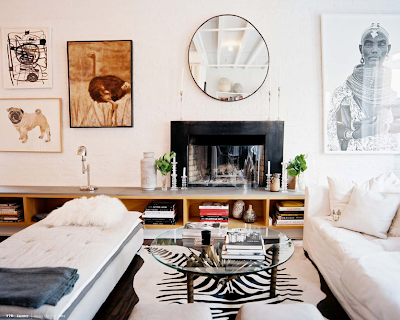 From the artwork, to the mirror, to the zebra rug...I can dig it all. Alright, back to work for me!